"In the midst of chaos, how do you find peace?" Superstar mezzo-soprano Joyce DiDonato turns to Baroque opera to answer this very contemporary question. This filmed concert at Barcelona's Gran Teatre del Liceu presents DiDonato performing arias from her latest album, accompanied by Il Pomo d'oro and its harpsichordist-conductor Maxim Emelyanychev. Joyce DiDonato's most recent CD began life as a project to present a collection of little-known Neapolitan Baroque opera arias in collaboration with the excellent Italian baroque orchestra Il Pomo d'Oro and their director Maxim Emelyanychev. Then, in the wake of the brutal November 2016 terror attacks in Paris, the musicians felt a more urgent calling to respond musically to the turmoil and violence of modern times. Their answer was an album of arias by Handel, Purcell, Jommelli, and Monteverdi that explore war and peace, both external and internal. 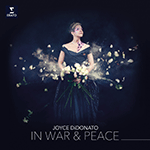 Joyce DiDonato appears courtesy of Erato / Warner Classics. Your Favorite Programs of 2017 Your Favorite Concerts of 2017 Baroque music Prima Donnas War and peace in music Let's celebrate American artists! Operalia, what have they become?